When working on improving the organization of your facility, you need to take many things into account. Identifying an efficient place to store inventory or parts, for example, is absolutely essential. In addition, you want to make sure you have all the machinery and other equipment positioned in a way that will promote efficiency and eliminate waste wherever possible. Another organizational step is to make sure everyone knows where they need to go in order to get where they need to be. Most facilities are quite large, and it can be confusing to try to navigate your way through the building. This is made even more difficult by the fact that most people only work in one small area, so they don’t really get a good feel for the layout of the rest of the facility. In order to prevent people from getting lost or wasting time looking for different areas, you can use floor markings to help point people in the right direction. While floor marking tape is one great option, you can get further benefits from using floor marking shapes. There are many different shapes available to choose from, and they can help in a wide range of different ways. Consider the following 10 uses for these floor markings, and how they can help your facility become more organized. Most facilities have areas where they keep products or parts or other types of inventory until they are ready to be used or shipped out. Without a well thought out plan, these areas can start growing as people keep stacking things up. To prevent this, use floor marking shapes to clearly identify where the item needs to go. One great shape for this is the corner, which you can use to show the outer limits of where you want a particular type of item to be placed. You can use these in conjunction with regular floor marking tape to section off specific areas for inventory storage. When there is an emergency or even a drill, it is essential that all the employees get out in a calm and organized way. When someone is in an area that they are not familiar with, they might not know which way to go, which can be very dangerous. This is why it is a good idea to use floor marking shapes to clearly identify which direction the nearest emergency exit is. You can use red floor arrows, for example, that always point in the right direction. Letting everyone know that these arrows are used exclusively to help people get to the nearest exit can help keep everyone safe and organized during an emergency. Of course, you can come up with any type of marking that you want to lead people to safety. The most important thing here is to make sure everyone knows which markings will lead them to an emergency exit. Virtually all large facilities have a variety of different indoor vehicles such as fork lifts, high-lows and others. It is important to make sure they are always kept in the proper location so people can use them when needed. Without a well thought out plan for this, however, it can get extremely unorganized. One great option is to use floor marking tape to create parking spots, and then identify each spot with a colored circle floor marking shape. For example, you can have one spot marked with a single blue dot, and then put another blue dot on one of the vehicles that is used. This way drivers always know where they need to return the vehicle. In addition to organizing the vehicles better, it can also help with the maintenance of them. By keeping track of which vehicle has had what type of maintenance, you can make sure you are keeping up on everything that needs to be done. This will help the vehicles to run better, and avoid any costly breakdowns. Another important type of organization is keeping people who are walking, and those who are driving, in separate areas. Taking the time to put down proper floor markings is a great way to do this. One of the most effective options is to purchase floor marking shapes that look like foot prints. They are easy to put on the floor and make it quite clear that a specific area is for walking. You can even purchase different colored prints so that you can help identify different paths that lead to different areas. This way people are safer, and also able to travel through the facility much more efficiently. Another great way that arrow shaped floor marking shapes can be used to improve organization is by identifying how the flow of work will progress. In many facilities, especially those that use some sort of assembly line, the work will progress from one area to the next, until it is completed. Placing arrow floor markings at the end of each area can help ensure each part progress properly. This can help to improve the overall organization of the facility, and prevent any unnecessary defects. In some production lines some pieces will need to go one way, and others another way. Using floor markings to help remind employees of what needs to go where can be very helpful. One place where organization is especially essential is on the loading docks. This is typically one of the busiest places, with people and materials constantly moving in and out. Using floor marking shapes can help identify what types of things have to go where, and how they should get there. There are many types of floor marking shapes to choose from, and thinking about how they can be most effective is very important. When done properly, these markings can help avoid accidents and injuries, and also help things get put on or taken off of a truck much more efficiently. If you have a warehouse area in your facility, you likely have multiple aisles of shelving where things are stored. If you don’t have it well planned out where each thing should go, it will be very easy to start misplacing or losing things. Over time, this can not only make a big mess, but also cost the facility a lot of money in wasted time and effort finding each part. Many facilities will use floor marking numbers or letters to identify each aisle. You can then also use labels or signs to indicate what products are in each aisle. Staying organized in this way can help streamline the whole process of putting things on the shelves, or taking them off. Another thing to keep in mind is that floor marking shapes don’t always have to be used on the floor. You can use them on any surface, including walls or shelving units. You can use different colored floor marking dots, for example, for different levels on your shelving units in the warehouse. Identifying each shelf with a set color will make it easy for people to find exactly what is needed. For example, you could have all of one specific part stored in aisle 3 (see the previous organizational tip) on the shelf with the orange dot. Of course, you could use any type of marking on the shelf to help ensure it is properly organized and easy to use for your facility. Another great way to use these types of floor marking shapes on locations other than the floor is by identifying the location of emergency equipment from a distance. If you have a fire extinguisher handing on a wall in one area, it might be difficult to see unless you are right next to it. If you put a marking near the top of the wall directly above the fire extinguisher, people will be able to quickly see where it is. This can help them to respond more quickly during an emergency, which is extremely important. Of course, you can do this with any type of emergency equipment including fire extinguishers, eye washing stations, and more. As you walk through your facility, you will undoubtedly identify other ways that you can use these types of floor marking shapes for organizational purposes. In addition to attempting to identify different uses yourself, make sure you let other department leaders know that they are available, so they can come up with some ideas too. When done properly, you will be able to come up with many different ways to get the facility much more organized. No matter what you are using floor marking shapes for, just make sure you apply them properly. As long as you stick them evenly on the floor or another surface, they will stick well and last a long time. With a little planning and effort, you can help your facility become much more organized by using these floor marking shapes. 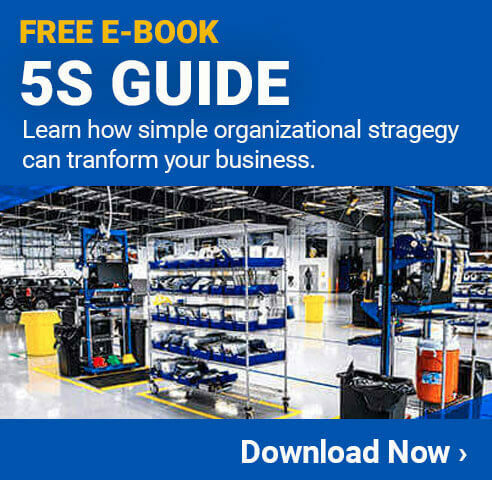 Are you looking for other ways to improve your workplace look into 5s.